Satechi is a very popular accessory maker. While the company's offerings often focus on complementing Apple devices (such iPhone, iMac, iPad, and MacBook), they usually work fine with other devices too, such as ones that run Android or Windows, for example. Today, the company releases two new USB-C accessories, both of which focus on power delivery. The more interesting of the pair is the Type-C Headphone Jack Adapter. As the name suggests, it converts USB-C to a 3.5mm headphone jack, but in addition, it allows pass-thru charging. In other words, if you only have one USB-C port, you can still charge your device despite listening to music with wired headphones. 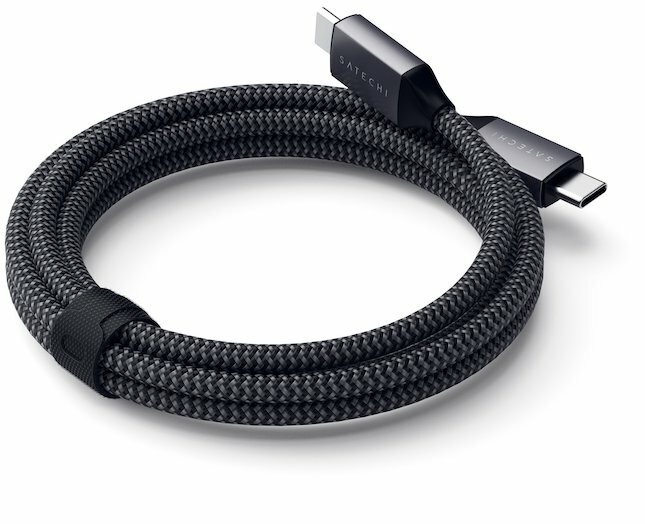 The other product, called "USB-C 100W Charging Cable," is (you guessed it) a cable. That charges. Yeah... Not super exciting, but the build quality looks exceptional, and the 2 meter wire can transfer data too. 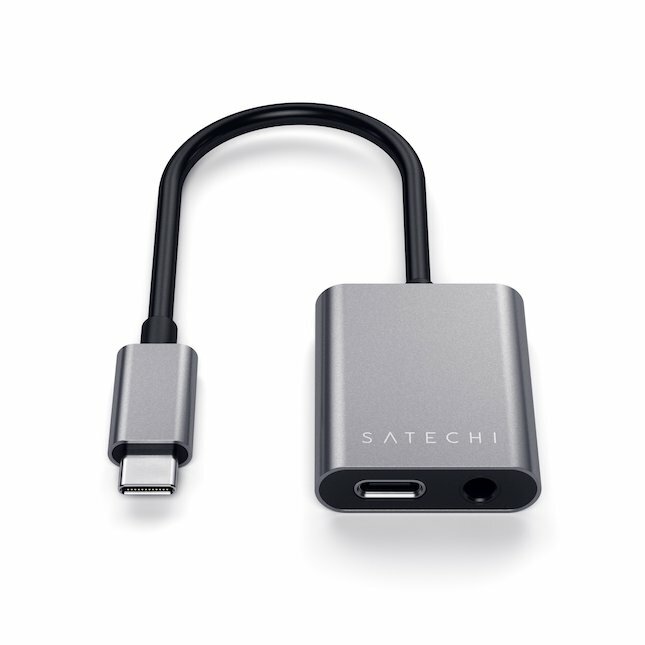 "Satechi’s Type-C Headphone Jack Adapter is the ultimate mobile acessory, featuring USB-C Power Delivery (PD) charging and audio control support for accessibility on-the-go. The handy adapter allows users to conveniently charge devices while listening to music, TV shows or podcasts, ensuring devices are always juiced when needed most. Uncompromising on both style and performance, the Type-C Headphone Jack Adapter delivers clear audio along with powerful charging, housed in a sleek aluminum enclosure. Simply connect the Type-C adapter to a USB-C smartphone, tablet or laptop for media control that travels with you," says Satechi. The accessory-maker further says, "The Satechi USB-C 100W Charging Cable is the ideal high-speed charging solution for Type-C devices. 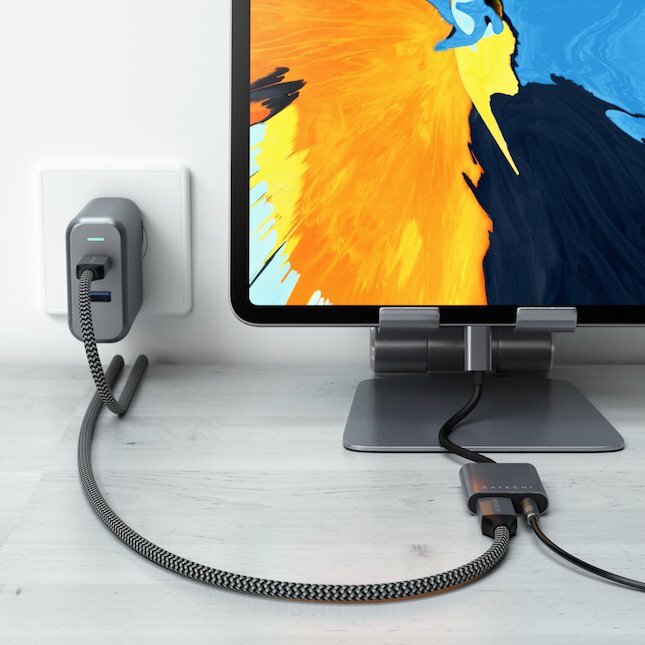 Featuring reversible USB-C connectors on each side, the cable fully supports Power Delivery (PD) and data transfer (up to 480 Mbps), including music, photos or movie files, between Type-C smartphones, tablets and laptops. Its durable, braided nylon design helps prevent against breakage to ensure a long lifespan, and the integrated Velcro strap keeps cables tangle-free. Simply, connect a USB-C device and a compatible USB-C power adapter using the USB-C 100W Charging Cable to enjoy fast and easy charging." As you can see above, the two products can absolutely work together. You can use the USB-C 100W Charging Cable and a power adapter to charge an iPad Pro, for instance, by plugging the cable into the Type-C Headphone Jack Adapter (or directly to the iPad Pro). Of course, this will also work with (most) USB-C Android devices -- Apple isn't the only company that ditched the traditional headphone jack! For whatever reason, Satechi says the Type-C Headphone Jack Adapter isn't compatible with the One Plus 6 or any Moto smartphones. Both Satechi products can be had from Amazon today in the space grey color only. The Type-C Headphone Jack Adapter is available here for $24.99. The USB-C 100W Charging Cable is $5 less than that, at just $19.99 here.